Give windshield washer fluid an adrenaline rush! 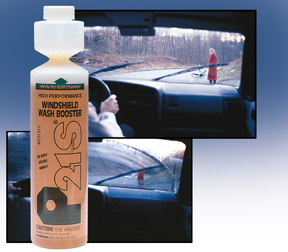 P21S Windshield Washer Booster will give your windshield the best protection against the elements. Higher Level of Safety. It’s good to be cautious, especially while driving in dangerous conditions. Here in Florida we deal with strong spotty rain showers which affect our ability to see clearly. Adding P21S Windshield Washer Booster is like an adrenaline rush for washer fluid. It will step cleaning up a notch, causing film, grime, and clouds to disappear. Many customers also benefit from the added bonus of not having to replace windshield wipers as frequently. Cuts through Grime. Here’s a scenario we all have been through. You just washed your car, and now you’re taking it one the road for a spin. Suddenly…splat! A big bug just landed right on the windshield, and it doesn’t want to wash it off with regular wiper fluid and wipers. This is a perfect time to add a shot P21S Windshield Washer Booster to your regular detergent. Greasy film, insect smear, and salt films will be removed with this powerful booster. From a Name You Trust. P21S is a German company that makes an incredible line of car care products that is regarded highly in the industry. These products include Total Auto Wash and Concours Carnauba Wax, two of many products highly regarded as the best. Precision and perfection are two qualities of German design, and P21S Windshield Washer Booster reflects flawlessly upon the P21S name. Q: Can I use this product with any windshield washer fluid? A: Yes, you can. P21S Windshield Washer Booster will work with plain water and all anti-freeze washer fluids. Q: How do I know how much of the booster I add to my washer fluid? A: P21S took the guesswork out of measuring. The bottle comes with a built in measuring cup that will ensure the perfect concoction for optimum performance. I have used it for several years; it really enhances the blue stuff. ProsReally good cleaner when used promptly. I have used this windshield wash booster for many years - Works great! It's a simple thing, but I couldn't drive without it! Especially with our winters here, it makes a huge difference! in keeping with the P21 tradition....this product picks up where your standard windshield washer cleaner from your local auto parts store stops ! It cleans bugs, road salt and any other road crap that might hit your windshield !